The bottom line is that I’m a lazy person. Many would disagree and say I’m a hard-working individual, but the truth is that I don’t like having to do more than is necessary. So, when it comes to technology, I feel the computer should earn its keep. The same goes for web sites. The problem I find with online research is that with good genealogy sites (i.e. ones that add new information regularly), you have to keep going back to see if they add something you’re looking for. Shouldn’t the site (not the webmaster) be able to tell you instead? Back in 1998 (seems like ages ago), I had the idea to equip my personal web sites with a tool that would allow visitors to be notified of new user contributions by email. I called it GenWatcher, and it is still a popular feature of my sites at the D’Addezio.com domain. [Read the 1998 announcement, “Test Drive Our New GenWatcher Service“] It wasn’t very sophisticated. Basically you entered a surname and your email address, and whenever someone else added something to one of our databases, the site (while it was saving the information) would check the GenWatcher list and send an email to anyone who was looking for that particular surname. 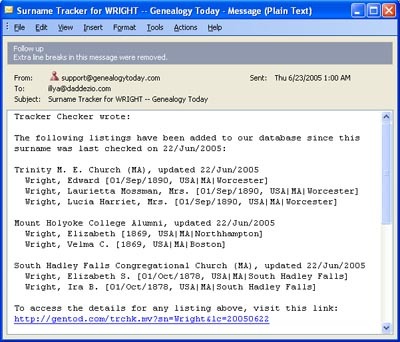 The idea received such good feedback, that a similar service was developed for Genealogy Today in 2003 called Surname Tracker (sample email pictured right). The difference with this new service is that it has access to much more information, and can tell registered users when new names are added to our databases. By the way, I use both of these services for my own research — you never know who may add some D’Addezio information! Well, the Surname Tracker is quite popular, with over 45,000 people registered and monitoring their surnames. 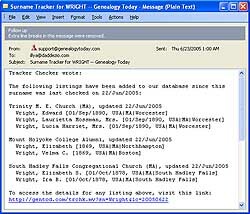 In 2002, the web site CousinConnect added a query notification service similar to our GenWatcher, but for their genealogy query boards. They even added a twist — you can decide if you want to be notified for “exact” surname spellings, “partial” surname spellings, or “soundex” matches. Then sometime in 2003 (as I can best recollect), Ancestry.com finally added an equivalent feature that is now simply labelled “names and locations I’m researching” (it’s under the My Research tab). Later, when they introduced their Obituary collection, they added another agent service called Obituary Hunter. The web site still says it is in a “beta period”, but it been around since December 2003 when I added D’Addezio to my account. I never used the former service, but just added my surname and a few variations as I’m writing this post. It’s simple to do. While I’m excited that people are using and benefiting from these services, the lazy part of me wants to know when we’re going to see more of them and/or better technology to make this easier for smaller sites to accomplish. Well, perhaps it has! As many blog readers have learned (some unknowlingly), there is a new technology, called RSS, that allows you to read news feeds offline and quickly and easily see what’s new. You’ve probably seen the little orange XML boxes and others like “+ My Yahoo!”. These are the links for adding an RSS feed to your reader. So, how well could this technology apply to a SURNAME feed? To my knowledge, CousinConnect is the only genealogy web site to offer a service of this nature. From their home page, search on your surname and then on the results page, scroll down and on the right hand column you’ll see “RSS Newsfeed” and those familiar buttons. Add the RSS feed to your reader and you’ll always see the latest queries for your surname. I just added D’Addezio! This seems like the right direction for web sites to follow, but I’d like to get some comments from anyone who has used it (or the other services). I imagine it would be great if all sites with real data could provide a similar feed and then every morning when you opened up your reader (e.g. My Yahoo!) you’d see what ancestors have awoken with you. I’m thinking of adding a similar service to Genealogy Today, and extending it beyond the bounds our own databases by offering to index new information posted by other webmasters. We already do index some other sites, but if I added RSS surname feeds, I would probably expand this to index others. If you are aware of any other sites that offer either an email-based agent or RSS surname feeds, please let me know.